Join the Breading Revolution See Them in Action! 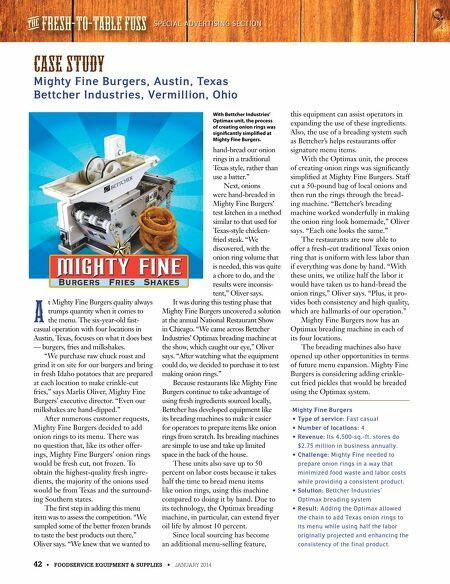 Our videos show all you need to know about the productive performance of Bettcher Breading Machines. View them at www.bettcher.com/breading-machines. 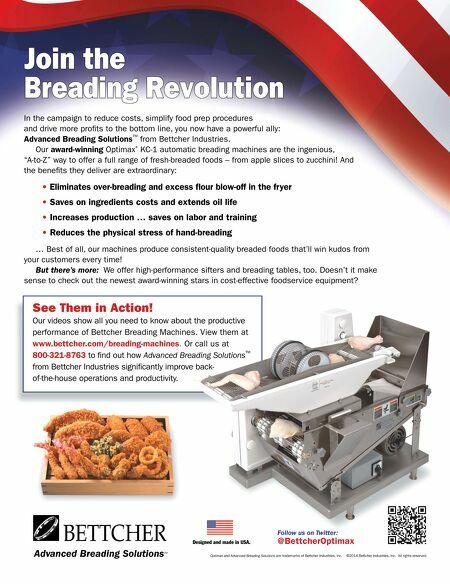 Or call us at 800-321-8763 to fnd out how Advanced Breading Solutions ™ from Bettcher Industries signifcantly improve back - of -the-house operations and productivity. Advanced Breading Solutions TM Designed and made in USA. Optimax and Advanced Breading Solutions are trademarks of Bettcher Industries, Inc. ©2014 Bettcher Industries, Inc. All rights reserved. Follow us on Twitter: @BettcherOptimax In the campaign to reduce costs, simplify food prep procedures and drive more profts to the bottom line, you now have a powerful ally: Advanced Breading Solutions ™ from Bettcher Industries. Our award-winning Optimax ® KC-1 automatic breading machines are the ingenious, "A-to-Z" way to offer a full range of fresh-breaded foods – from apple slices to zucchini! And the benefts they deliver are extraordinary: • Eliminates over-breading and excess flour blow-off in the fryer • Saves on ingredients costs and extends oil life • Increases production … saves on labor and training • Reduces the physical stress of hand-breading … Best of all, our machines produce consistent-quality breaded foods that'll win kudos from your customers every time! But there's more: We offer high-performance sifters and breading tables, too. Doesn't it make sense to check out the newest award-winning stars in cost-effective foodservice equipment?